Bus from Seremban to Changloon is the only mode of transport for local to travel between Seremban and Changloon. Many people especially local travellers prefer to travel by direct bus from Seremban to Changloon because it is affordable and convenient. Suasana Edaran Express, Trans MVS Express and Intercity Coach are the few bus operators running bus from Seremban to Changloon. Intercity Coach is particularly popular among the travellers because of its strong presence in Northern Malaysia. Besides that, Intercity Coach is the only operator offering high deck coach for this service route. The daily direct bus service from Seremban to Changloon starts from 8:00am to 10:45pm. Kindly note that the daily direct bus service from Seremban to Changloon is not available in the afternoon. The duration required for bus from Seremban to Changloon is about 7.5 hours depending on traffic and climate condition of travelling day. The duration from Seremban to Changloon would take longer during peak hours and festive season. Washroom break will be given during the journey. The range of the bus fare from Seremban to Changloon is from RM 55.00 to RM 65.00 depending on your selection of bus operator. The departure point in Seremban is at Seremban Bus Terminal One. The arrival point in Changloon is at Changloon Bus Terminal. 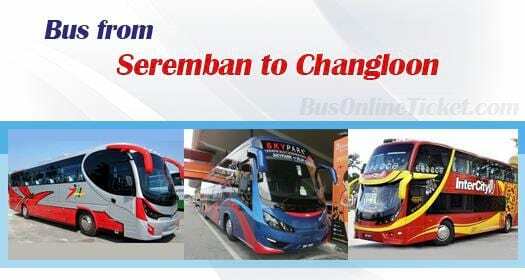 Even though there are daily bus service from Seremban to Changloon, passengers are required to book bus ticket in advance due to limited seats offers for this bus service. Everyone can book your bus ticket online through our online portal BusOnlineTicket.com. Instant confirmation of booking upon payment.